ATV, UTV, & Side by Sides: What's Your Experience and Reviews? Home › Forums › Self-Reliance & Preparedness › ATV, UTV, & Side by Sides: What's Your Experience and Reviews? This topic has 34 replies, 14 voices, and was last updated 9 months ago by Joe (G.W.N.S.). 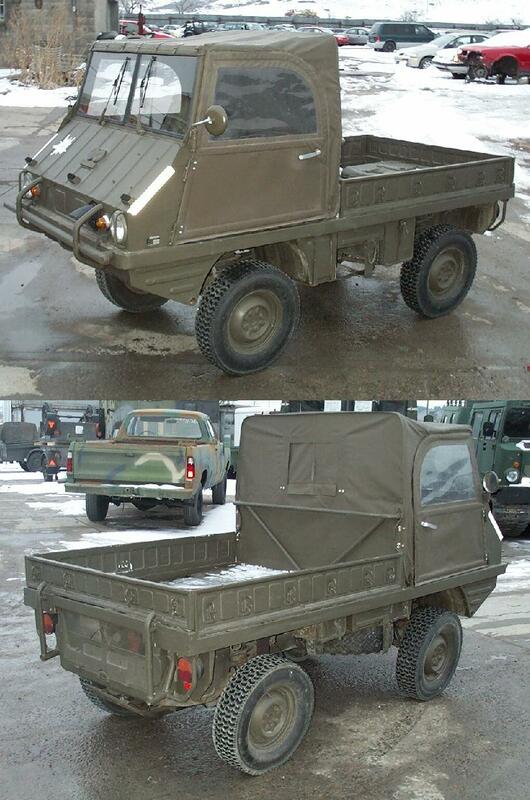 That’s how I ended up with 2 ex-Swiss Army vehicles. I am a fan of the Steyr Puch Haflinger, but the days of finding a low priced clean example seem to be a thing of the past. Many are street legal too, but forget highway speeds. Go to 4:40 Mark to see them going through their paces. 14:40 Mark to see military convoys with beltfeds and recoilless rifles. I paid less than 18K for the 6 wheel 712M and about the same for the 4 wheel 710M in my sig pic. They’re great trucks. The 710 will carry 10 troops, 2 in front and 8 in back, will carry a ton of supplies. The 712, will carry 12 troops in back and 2 in front. Or a ton and a half of supplies. Both are 4 cyclinder air cooled, with portal axles, and hydraulic levers for 4 or 6 wheel drive. Top speed 60 to 65. About 12-14 mpg on no lead. The new diesel ones are around $30K and water cooled. Wouldn’t it be a pain to get parts for those European off-roaders though? My mom got a Geo Tracker once upon a time, engine went up pretty quick (the dealership wound up being really shady and shut down shortly thereafter), and we had to scrap it because no one had a replacement engine. And that was a car actually sold in the States in good numbers. IIRC there isn’t too much work to make an ATV street legal, you just need appropriate lights and turn signals, DOT-approved, tires, seatbelts, horns, etc., and it’s basically treated like a kit car. The Mahindra looks cool as hell but we can’t afford anything other than used vehicles, let alone ones we can’t drive on roads without modifications. I’ve got an old Artic Cat 500, will never get rid of ot. I may be a little weird but for my AO I’m saving my shekels for a Rokon. Wouldn’t it be a pain to get parts for those European off-roaders though? Back when I considered the Haflinger a good bargain you could have purchased an extensive support package for a couple thousand extra. In my AO it is very difficult to jump through the legal hurdles to accomplish this. It varies by Local and State. I may be a little weird but for my AO I’m saving my shekels for a Rokon. Good vehicle for many uses.